We here at iSlaytheDragon love slaying dragons. I mean, it’s in our name and everything. But modern dragon slaying can be cumbersome and frustrating. There’s a ton of bureaucratic red-tape to comply with the Endangered Species Act. PETA is around every corning crying about draconum rights. And have you seen the price of chain mail these days?! So what’s the alternative to strapping on a broadsword and risk being charcoaled? Why, to be the dragon, of course! Dragon Clash pits you as one such ferocious beast in mortal conflict with another. Will your might and magic triumph? The best part is that no politician or activist can complain – I mean as a dragon, you’re only acting within your nature, right? 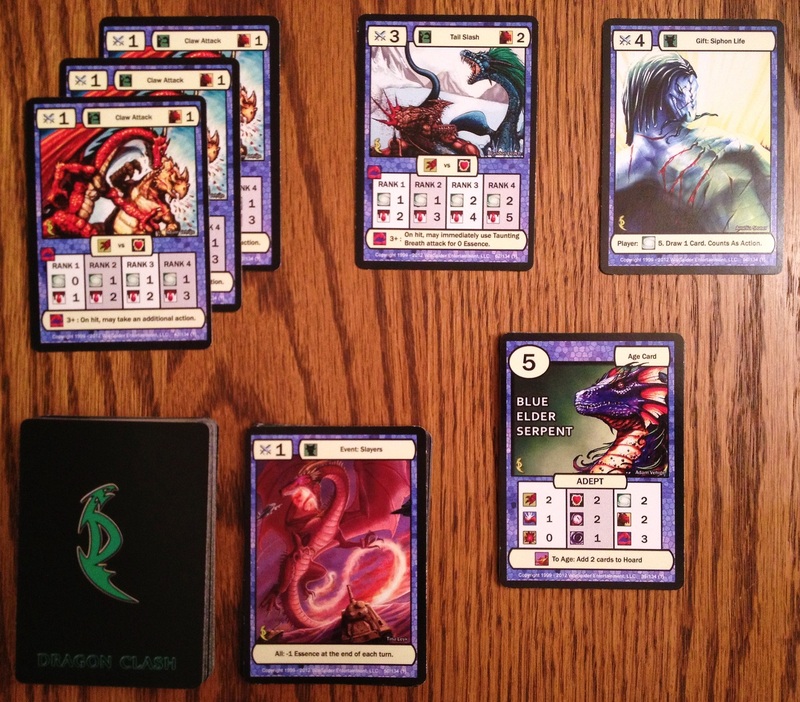 Dragon Clash is very much in the style and manner of a collectible card game (or CCG). However, instead of mortgaging your children’s future or selling your mother-in-law (although, that’s still an attractive option) in order to collect cards with which to build your own deck, you only need to purchase one or two complete, standalone packs. In that vein, the title may resemble more a living card game (LCG). But even that model can send you frequently to the blood bank selling plasma in order to afford the numerous expansion packs. Dragon Clash decks, on the other hand, are separate and independent and not customizable with add-ons. Currently there are four, each with a unique theme, style of play, strengths, weaknesses, and focus. This review is based on plays with the Red Breather and Blue Adept decks. Your goal in Dragon Clash is to play cards that will grow and train your dragon, give it gifts and other boosts, and attack your opponent. 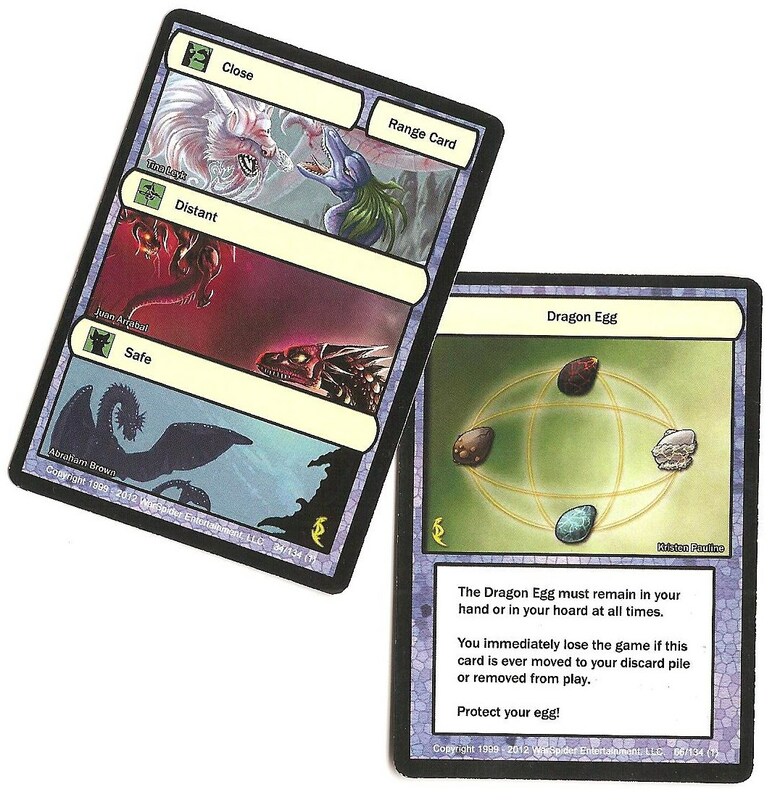 You start with an Age 1 Dragon card laid out on the table, a Dragon Egg card that you must protect, and a hand of other cards of various types. 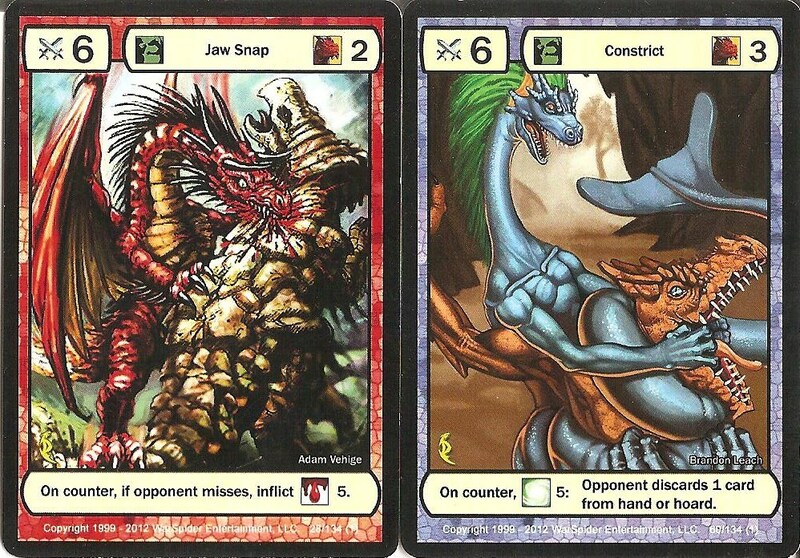 The first combatant to lose his Dragon Egg is defeated, which typically happens when running out of cards in his deck and hand, but can occur sooner if he isn’t careful. Each turn has five phases. First, you are allowed to Regain Essence. This is essentially the game’s currency. Many abilities and attacks require you to discard cards in order to play them, which in game terms is “paying Essence.” Your dragon’s current age determines the amount of Essence you can regain this phase. The second phase is simply to draw one card from your deck. The next phase is ResolvingRange. Each player has a range card with three distances: close, distant, or safe. Range dictates which cards you can play in the action and attack phases, so here you can pay Essence to modify that. Logically, you and your opponent are always the same distance apart (no alternate universe stuff going on here), so when one player adjusts this, the other must follow suit to match. You can also play a Burst card, instead, which allows you to alter range for free. However, your opponent may also play Bursts after yours to change it back – or to something completely different. Next is the Action phase in which you may take two actions from among three options: hoard a card, age your dragon, or play a card. You can hoard a card for one action by placing it face down beneath your current Dragon Age card. This can be any card from your hand, including your Dragon Egg. Once you have hoarded two cards, you can use one action to age your dragon. At that time, reveal the two hoarded cards, discard one and return the other to your hand. You can never discard your Dragon Egg as that would mean defeat – and dragons are too smart for that! There are actually two ways to age your dragon. One, you can shed its skin and grow by replacing your current Dragon Age card with the next increment. This gives you better abilities and stronger attacks. Or instead of aging to the next level, you can train your dragon. Here you simply search through your deck for an attack card of the same type that you currently have in play, reveal that card, and add it to your hand. The third choice available to you in the Action phase it to simply play a card for its specified benefit or ability. Effect cards generally grant a specific action, but may require you to pay Essence. Gift cards grant your special buffs, but you may only have one in play at a time. Event cards introduce certain parameters that affect both players, but again only one Event may be in play. Finally, Attack cards can be played, but are not actually resolved during this phase. While this sounds simple in theory, playing cards requires careful observation. First, you need to consider any applicable Essence costs. Second, most cards also have a Tactics and/or Range value. If any value exceeds your current Dragon Age’s rating in the same category then you cannot play that particular card. Finally, attack cards are subject to your Dragon Age’s current Ability rating. For each copy of the same attack card you play, your skill in that type of attack increases one rank. The higher an attack’s rank, the more powerful it can be, but you can never play more than your Ability allows. The last phase allows you to attack your adversary. Here you declare which attack you wish to initiate from the types you have played to the table. You will generally need to pay an amount of Essence according to its rank and you also must verify you are in the appropriate range for that assault. 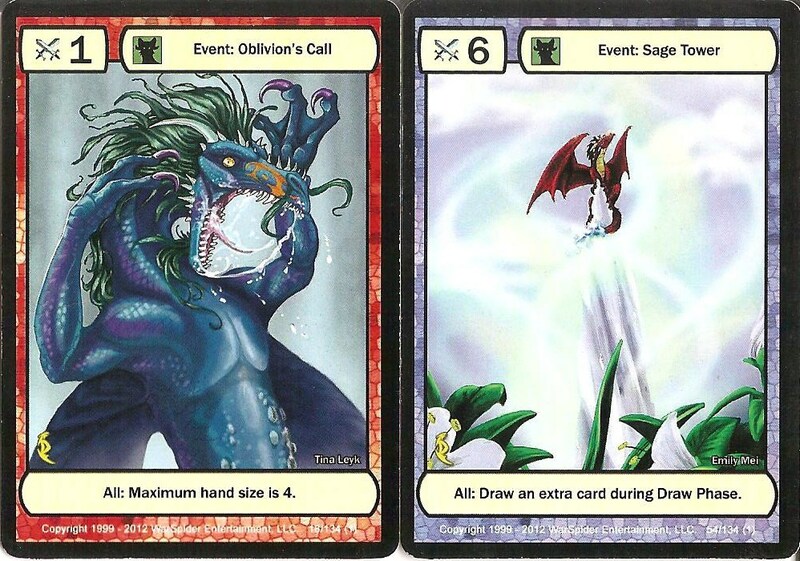 At this time, your opponent may play a Counter card which can provide various benefits – sometimes outright, sometimes depending on the outcome of the fight. To resolve damage, you check three things. First, each attack card specifies whether it is a melee, magic, or breath attack for which you’ll need to consult your current Dragon Age card’s rating in that category. Conversely, the attack card specifies the category of defense with which your opponent must also cross-reference his current rating: body, will, or resist. Then each player draws a card from their deck. The battle value at the top left corner (all cards have a number from 1-6) is added to your respective offensive and defensive category values. If the attacker’s total is higher, the attack card will stipulate an amount of damage the defender takes, which is represented by discarding that required number of cards from the draw deck. If the defender’s number is equal to or greater than the attacker, that attack misses. Cards drawn for battle value are placed at the bottom of each player’s decks upon resolution. To add yet another layer of nuance, all attack cards have unique abilities that apply to successful hits, but only beginning at the higher ranks. And on top of all that, attacking is optional. You can do nothing, or instead you may perform Tactical Sense. Here you can spend an amount of essence up to your current Tactics rating and draw an equivalent number of cards, re-ordering them in any sequence you wish back on top of your draw pile. At the end of your turn, your hand size may not exceed seven cards. Two types of attack available (upper left/center), a gift (upper right), plus the deck, discard pile, and current Dragon Age (level 5). Smaug the Golden or Puff the Magic? Dragons have often been a misunderstood lot. Fierce, powerful, and destructive, most dragon legends and stories also portray these fiery beasts as protective, intelligent, and cunning. There’s more to these creatures than meets the eye. The same can be said for the game Dragon Clash. At first glance, it looks like a relatively simple and straight-forward card game. My boys and I have many in the genre and they are Pokémon fans, as well, so I thought this would be right in our wheelhouse. However, there are many icons and several intricate stipulations through most of the turn phases. This game really requires a couple of play-throughs to completely understand not only the rules, but how to develop and implement an effective strategy through them. Dragon Clash presents you with some agonizing strategic choices. Or I guess the choices aren’t agonizing, but rather the fact that you only have a limited number of actions in which to perform them. 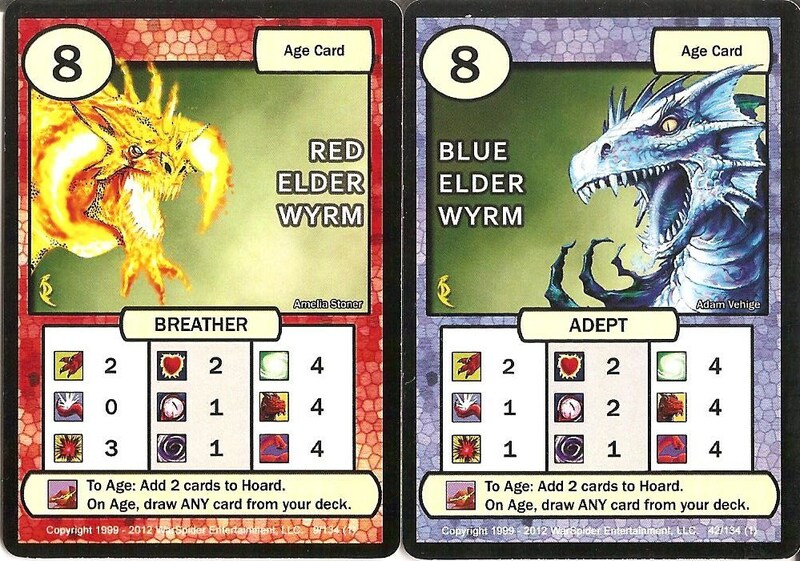 Spending actions to hoard cards and then aging your dragon is very tempting, but then that limits the attacks and other supporting cards that you can play which give the title is very real CCG-feel. Also when aging, you need to decide if growing to the next level is important, or if training your dragon to rank up an attack would serve your plans better. Growing is indeed significant, but also useless if you can’t find and play several duplicate attack cards to increase rank and, therefore, potency. Choosing the right attack type(s) given the game’s specific development is also critical. Some attacks are costly while dealing limited damage, but may apply a special ability that can tip the balances. The unique dragon breed decks will also interact with each other differently, and so finding ways to exploit vulnerabilities with your strengths will often prove the difference between victory and defeat. Not to mention that it allows for some fun experimentation and good replay value. Note the dragon head icon in the upper right means these powerful attacks require a Tactics rating of 4. Perhaps the biggest drawback that most people will have with Dragon Clash is its randomness. Discarding cards to resolve damage and pay for actions and attacks is not a new concept. However, this model often puts desired cards out of the game with no way to recover them. The only way is through regaining Essence at the beginning of every turn, but that only pulls cards from the top of the discard pile and not very many of them until you age. You can pull specific cards from your deck through training – after you’ve hoarded two cards and forgo growing to the next level. But that’s a slow process. Before Age Level 8, you can only search for attack cards already played to the table, which is still extremely helpful in ranking up your attacks. Otherwise, you’re subject to the whim of the draw to increase your assaults’ power. For experienced and dyed-in-the-wool CCG players, this limited deck manipulation may seem restrictive and frustrating. There are some other minor deck management measures. When regaining Essence, you return the gained cards to the bottom of your deck in any order you wish. But we’ve found this aspect of little importance until the late game. Tactical Sense allows you to reveal a number of cards from the top of your deck and re-order them however you like. However, this is at the cost of discarding a like amount. Then there are a couple of card effects which involve healing to regain Essence. If you have one at the right time, it can be very helpful. When you play an event card, its effects apply to both. Both the restrictive deck mining and the random card cycling to resolve damage and pay Essence make it difficult to sustain a strategy in Dragon Clash. Yet it is certainly possible. There is a tense struggle between pursuing your overall plan while managing the randomness at the same time in order to take advantage of the developing tactical situation. You’ll either go mad or savor the challenge! It certainly proves very rewarding when you’re able to pull off that combination of maximizing your ferocious beast’s evolution with a singularly, devastating attack. We’ve discovered that you really need to focus on one or two types of attack, lest your resources get spread too thin. That way you will be able to concentrate on growing your dragon and ranking up its limited arsenal, while still sparing actions for other card play. The artwork is very good for the most part with enough variation in species to delight fantasy fans. Dragon Clash utilizes its theme well with interrelating growth, training, and power while considering things like distance and energy. The cards themselves are of average stock quality. If you play often, you should consider sleeves. Counters are good ways to mess with your foe’s attacks. There are a few rules which seem solid, but prove less practical in actual game play. For example, we rarely paid to adjust the range between our dragons, because all cards can by played within their range or closer. Therefore, only the close range cards were all that restrictive. Maneuvering distances sounds like it would allow for some deft tactical moves, but since “distant” attacks can also be played in “close” range, we primarily stayed in the latter for most of the game. Now, I will say it is fun to play burst cards during your opponent’s turn to move them out of range for their favorite attack. Of course, that’s only effective as long as they don’t have a burst card of their own. Another rule we rarely utilize (by the book) after trying several times is Tactical Sense. Revealing and rearranging a few cards on the top of your deck is appealing. But it is completely random. In paying for the privilege, we often discarded good cards that we wanted and ended up with less helpful or useless ones that didn’t matter in what order they came. These are minor issues and really depend on personal play style and preferences. One final aspect to note – the game can run long. All of our games have been around the one-hour mark, at least. That’s not necessarily bad, if you’re expecting it, but seems long for the style and genre. I’m not sure how you could complete a game in or under 30 minutes, unless you’re lucky with feasting on your opponent’s hoard (a specific effects card) when their Dragon Egg is in it. But we never place our Dragon Eggs in our hoards for that very reason. Therefore, our games run essentially until someone’s deck is exhausted. Since you regain cards each turn and attacks are hit-and-miss, it’s not uncommon that you actually gain cards in your deck for some turns, rather than experience any sort of net loss. With only two actions per turn, it can take awhile to age your dragon and rank up his attacks to a level where you’re inflicting lots of damage each round. However, at the same time, those powerful attacks also cost a lot of Essence, so you soon discover that both decks are dwindling fast as your approach the endgame. Then gears shift a little as you start scrambling for every spare card you can gain back; or try to add on to every little bit of damage you inflict on your enemy. The Elder Wyrms – the ultimate development of a killing machine! 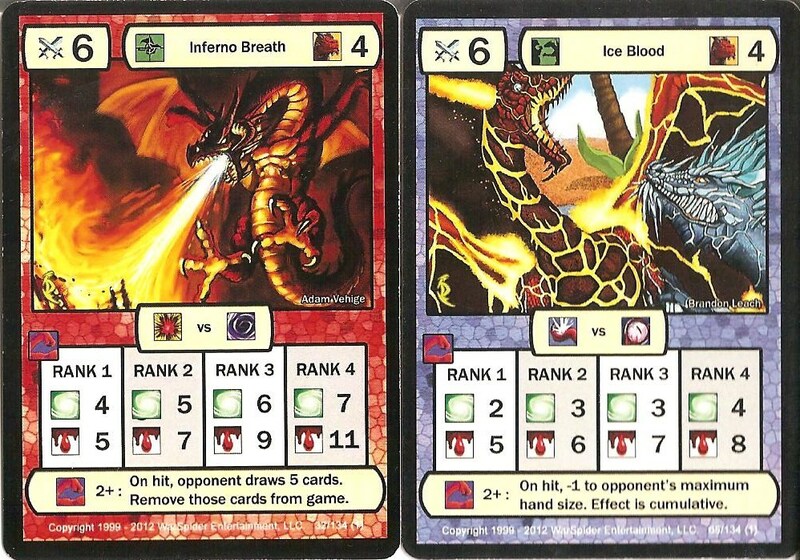 Due to its theme and challenging play, Dragon Clash is more of a “gamer’s game.” It should appeal to CCG fans who don’t want to invest in the collecting aspect of yet another game – or those simply wanting the experience without the cost. I imagine it will also be a hit among fantasy fans, and interest card players looking for deeper options within the genre. While game play is quirky at times, it is nonetheless a solid effort with evocative artwork and design, and is certainly a good value. This thinky title presents some difficulty in implementing a strategy, but is the more rewarding for it when you can pull it off. In the meantime, the tactical struggle to reach that point is tense, arduous, and fluid as the contest ebbs and flows. With a great deal of randomness and limited ways to manipulate your deck, Dragon Clash is a challenging, sometimes frustrating, battle of wits. 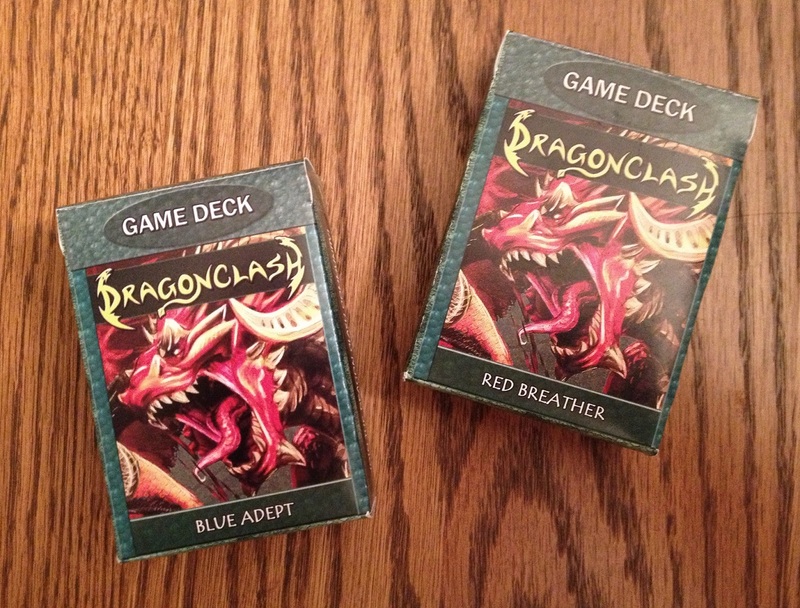 iSlaytheDragon would like to thank WarSpider Entertainment for providing review copies of the Red Breather and Blue Adept decks of Dragon Clash.